We’re ALL mad here. For as long as I’ve been hosting Women’s-Only Dance Parties, I’ve thought about hosting a Disney-Themed party. I mean, come on!!!! Who doesn’t LOVE a good Disney Theme?! 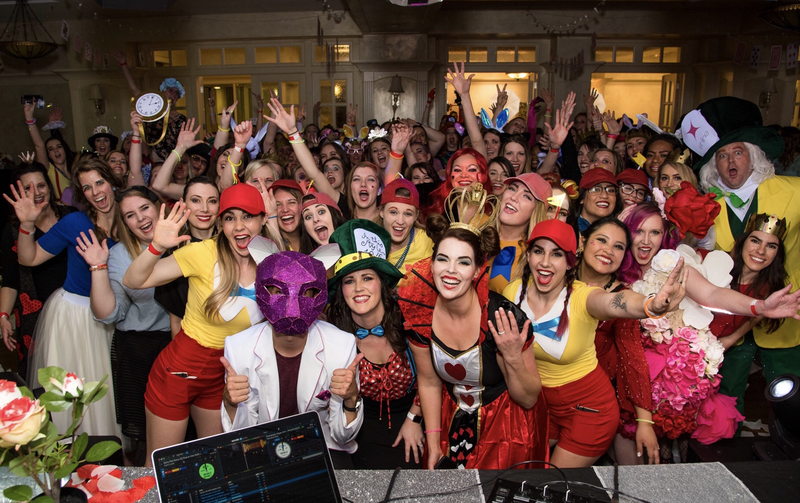 There are so many directions I could’ve gone (Princesses, Villains, ANY of the movies really…) But NOTHING felt as right as the Wonderland Themed Dance Party. This party was definitely one of my favorites, I think the biggest reason for that is how ALL-OUT you ladies went with your hair, costumes and makeup! Oh and SO many Tweedledee’s and Tweedledum’s (insert all of the heart-eyed emojis!) We made sure we covered all of the Wonderland details to bring this event to life including, Queen of Hearts croquet. The infamous Alice in Wonderland door knob, thanks to my husbands trusty 3-D printer!!!! Confusing signs and a diffuser that pumped rose essential oil aromas into the room. The Mad Hatter Tea Party (Sponsored by the lovely ladies from Lunchbox Wax)! They offered each guest some incredible swag and rainbow eyebrows to complete their ensembles. This was such a fun way to tie in some bright colors for this party. Heart lips and full makeovers were offered by Shine Cosmetics. They dressed the team up as a deck of cards and one of the owners dressed up as the Mad Hatter! They were so much fun to have at this party! Getting those Queen of Hearts lips and makeovers on. A “painting the roses red” topiary was a fun spot for selfies, and boomerangs. My favorite guys from The Selfie Scene brought their green screen to take our photos, and transport us to Wonderland. Always a fan favorite. We had a blast dancing the night away, enjoying beverages from WM Nutrition and Jolly Llama popsicles. Guests refueled on San Diablo Churros, dulce de leche is my FAVORITE flavor filling. There is something seriously magical that happens when you get over 200 ladies together, give them a theme, food and tell them to dance the night away. I swear at some point all of the Tweedledee’s and Tweedledum’s had all found each other and were moshing, it looked like a gorgeous jumping group of yellow and red! We brought out the toilet paper cannons, and did confetti cannons with re rose petals (of course) always a winner! Thank you again to all of the sponsors for coming, for each guest who came and made the event so much fun with your creative costumes and killer dance moves. I’ll see you next time at the Fairy Dance Party! ⟵Book the Sitter, It’s Time To Dance!